PaleoKrunch was the second product in the PaleoGoods line up. 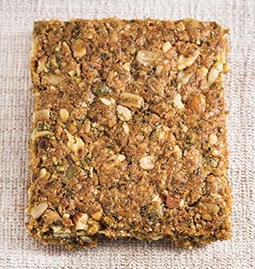 Over the past 8 years, PaleoKrunch bars become a snack staple and a must have on-the-go breakfast. While supplies last, all orders over $50 will receive three free Original PaleoKrunch Bars. Don’t wait! We should sell out of this offer in just a day or two. Everyone loves our Original PaleoKrunch recipe. You must place three Original PaleoKrunch bars in your cart to receive the promotion. Use code threefree to receive the discount off of your total order. Please note: the threefree code will only work when your order is over $57.50 and you have three Original PaleoKrunch Bars in your cart. The code will reduce your order to a minimum of $50. Please email info@stevespaleogoods.com with any questions. We start by sourcing the best ingredients we can find. Our Original PaleoKrunch is a blend of almonds, coconut, pumpkin seeds, sunflower seeds and honey. We use raw nuts to retain as much of the natural CRUNCH as we can. You have told us that’s what sets us apart from the rest, and your feedback is the most important. You want big flavor and and even bigger crunch. We don’t believe in pulverizing ingredients to spit out finished bars at the speed of light. Walk through the kitchen at Steve’s PaleoGoods, and you will see real people making real food! We mix all the ingredients and tray up your PaleoKrunch by hand. Minimal processing leaves the ingredients in our products closest to their natural state, making them healthy and delicious. We’ve achieved the perfect crunch by blending the best ingredients we can get our hands on and baking them to perfection. The actual temperature and time is a trade secret, but the result speaks loudly for itself. PaleoKrunch Bars are great for those looking for portion control or something to throw in a bag for on-the-go! Is Your Food Quiet or Loud?